A super quality, pair of French crystal water bottles. This design was made by Baccarat and they date from c.1870. The bulbous body of the bottles has a very narrow, elliptical cut design which has facets cut around the centre of it. The necks of the bottles have a long, wide, cut design with facetted edges. 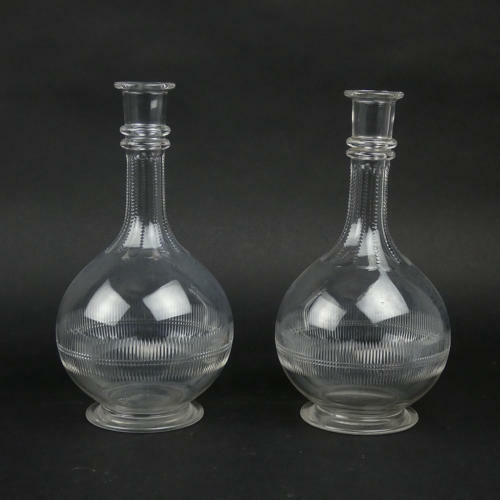 Overall, the design, although quite simple, is very elegant and both bottles are in excellent condition. We are selling them as a pair but there are marginal differences in the size. The one that we have given the dimensions of is approximately 3mm taller that the other. Price includes postage within the U.K. Shipping to the U.S.A. add £25. Western Europe add £10.